With a goal of increasing awareness and generating interest for the HP ISEE service product, HP required the creation of a self running product kiosk demo that could also be optimized for web usage designed to appeal to HP�s vast worldwide prospect audience � IT Professionals, Business Managers, and Channel Partners. While adhering to HP design guidelines, rich imagery, audio, and transitional effects were crafted and woven together to create this engaging demo piece using a navigational/lighthouse metaphor. 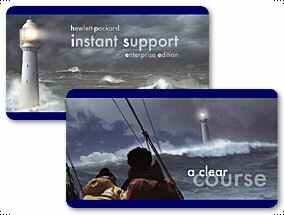 Audio messages such as "HP ISEE, guiding you through rough waters" and "setting a clear course" helped to reinforce this visually compelling theme.